Daikin has been cooling Aussie homes for over 40 years. A world leader in air conditioning, Daikin can be found in homes, offices, hotels and shops right here and across the globe. With world-class production facilities here in Australia, Daikin strives to drive advances in energy efficiency and improve in-home comfort. 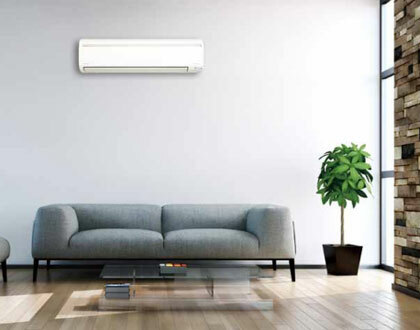 Whisper quiet with a 5 Year Warranty for parts and labour on all Daikin split, multi-split and air conditioners professionally installed in domestic premises, you know you have many years of worry free comfort ahead. Dale Air is proud to be a trusted distributor of Daikin. Chill out with Daikin and Dale Air. Super Multi NX requires only a single outdoor unit to maintain optimum comfort in up to five rooms. Indoor wall mounted type unit prevents uncomfortable drafts from blowing directly on to a person’s body. Read more about the Daikin Split System Air Conditioning Systems.